the best Home-Style Georgian Cuisine in St. Petersburg! Adzhabsandal Restaurant: the best place to go for Georgian food in the Imperial city. We don't want you to miss this hidden gem located on a side street two blocks off Nevsky Prospekt near the Fontanka River and the Church of the Eighteenth Century in the historic center of St. Petersburg. Starting from the left, a view of the restaurant; while on the right-hand side a waiter in a Georgian dress, to follow a home cake Adzhabsandal. Those of you who are familiar with Georgian cuisine know that Adzhabsandal means vegetable stew, but what you may not know is that the chefs here make it six different ways using recipes passed down through many generations! 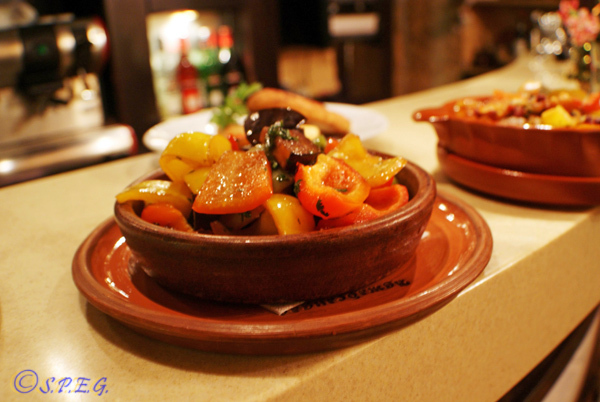 Trust us when we say this is the real deal – authentic, home-style cooking that reflects the peoples of the Caucasus. The cozy ambiance with soft lighting will make you feel right at home and if you'd like to dine in one of the charming, curtained booths on cushioned sofas, just call ahead to reserve one. Live music at the restaurant on Friday and Saturday evenings. And if you're enjoying traditional khachapuri, lobio, shashlik, satsivi, kuputy and adzhabsandal on a Friday or Saturday, you'll be delightfully entertained by beautiful Georgian music and spirited dancers. 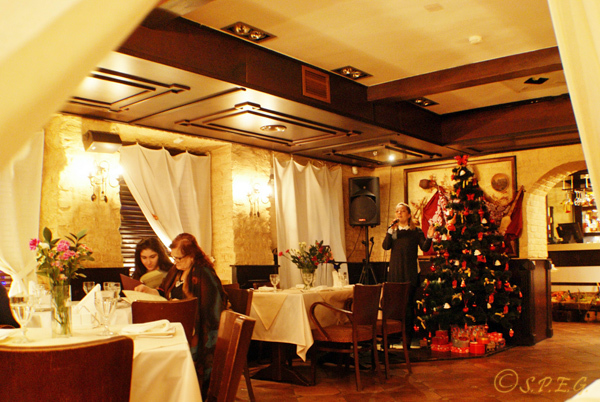 The live performances set the Caucasian atmosphere to bring you festive, Russian-inspired dining! If we were to describe the food at Adzhabsandal Restaurant, we would have to say that it's fresh, savory, satisfying and very memorable! They also have a great selection of proper Georgian wines on a par with Italian and French wines, so if you order the tasty rolled eggplant with nuts, ask your waiter to suggest a perfect pairing. Adzhabsandal Salad: the national Georgian dish. Our favorite dishes are Adzhabsandal with eggplant, tomatoes, peppers and herbs, lamb shashlik, hot bread from Tandoor and any kind of khachapuri – a delicious cake with cheese or meat. They have an English menu and the waitstaff speaks English, but most of the patrons are locals and people from Caucasus who are the true connoisseurs of down-home Georgian cooking! The waiters provide thoughtful, quick service and the portions are generous, so it's fun and easy to share a meal to enhance the experience. PRICE RANGE: $$$ - from $20/18€ to $32/30€ per person for a full meal, including a glass of wine and a dessert. KNOWN FAVORITES: Adzhabsandal, shish kebabs, khachapuri, lobio, сhinkali with meat, dolma, pirosmani, baclava, cake "Adzhabsandal”. OUR FAVORITE DISHES: Khachapuri, adzhabsandal, fried suluguni cheese, lobiani, Georgian Salad, Georgian wine. OUTSTANDING POINTS: 10 minutes walking distance from the famous avenue Nevsky Prospekt, very close to Fontanka River, the Bolshoy State Circus, the Church of St. Simeon and Anna the Prophetess. GOOD FOR: Families with children, friends, large groups, businessmen, Caucasian cuisine and dancing fans, entertaining clients, celebrations of any kind. Working Hours: Daily, from 12:00 am to midnight. What to get a better look inside the Adzhabsandal Restaurant, then click here! Make your reservation easier, faster and stress free! Book with St Petersburg Essential Guide a table at the amazing Adzhabsandal restaurant and get a free delicious dessert and the best table of course. Reservation with us is free, simple and convenient! Have you been to Adzhabsandal restaurant? If you have, please tell us how was your eating experience. Leave a comment below as a guest or sign in with your favorite social account. It only takes a minute. Thanks! 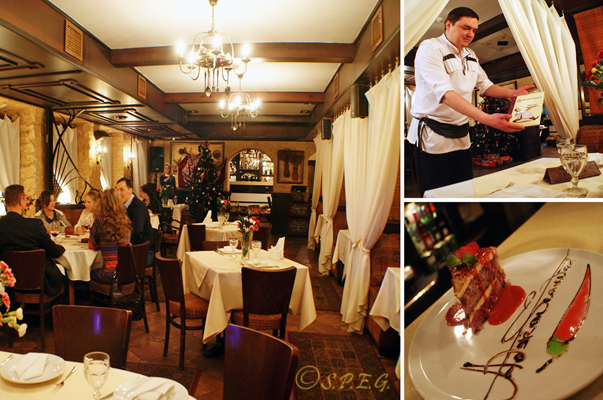 From Adzhabsandal Restaurant return to St Petersburg Restaurants or go to the Homepage.